Has anyone seen the exclusive Venom or Spidey at Walmart? On Saturday/Sunday, I didn't see either of them at either of our local WM stores. I don't think it was because they were "sold out" either - as it didn't seem as if many people were out looking for these as you might see on a big Star Wars release day. At least that was my experience. I haven't seen them here yet, but I'll be checking again this week. I wouldn't mind picking them up, unless the pricepoint is outrageous. I think they are supposed to be basic figure price, but at our Wal-Mart, that's already pretty pricey at nearly $9. The one Wal-Mart that I've been to since the Saturday release had a bunch of Spider-Mans, but no Venoms. Same with Neil. Had I seen the Venom (It's actually black! Who knew!) I'd have been all over it. 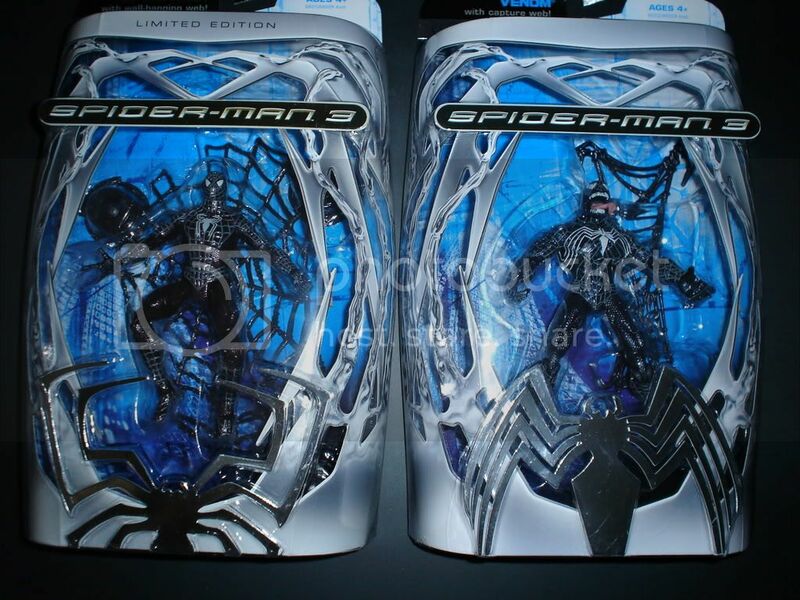 Has anyone seen the Wal-Mart Exclusive SPidey/Venom limited editions ? I keep hearing about them but have no idea what they look like, anyone have a pic? I stopped by WM this morning, and found the Exc. Spidey. They had about a dozen or so of the Spidey, but no sign of the Venom. Also, our local store has lowered their prices since Sunday (from $8.67 to $7.88), but the "exclusive" Spidey was $9.96. Also, our local store has lowered their prices since Sunday (from $8.67 to $7.88), but the "exclusive" Spidey was $9.96. I stopped by my local K-Mart looking for 30AC figures this AM and I noticed the Spidey 3 figures there are... $10.49 plus tax. I thought $7.99 for these was crazy, but dang! Yeah, the stores are pricing these things crazy for the most part. Especially when Hasbro (ToyShop) is selling them for $7.99 themselves - it shouldn't really be higher than that. Target is definitely the place to be this week, for anyone who is interested. I picked up the figures there for $5.99 each. That's much more in line with what they are worth. They aren't bad figures though really, the scale/articulation issues aside. Having them set up on the desk here, I can't say I would have minded if the Legends line had started at this type of scale from the beginning. A little easier to manage - space wise. Speaking of Legends, I see there are a couple reports on the Fwoosh forums of HML2 showing up at Wal-Mart. One of the reports was from South Sioux City, NE of all places. I checked our store today while I was there, but just found 2 Hercules and a Banshee on the pegs. Maybe keep an eye out in your areas though. Thanks for the pic, i like the shiny look. Are they going to make an Eddie Brock figure of Topher Grace? This may not be news, but a local collector grabbed the ML Blob wave today at Wal-Mart.